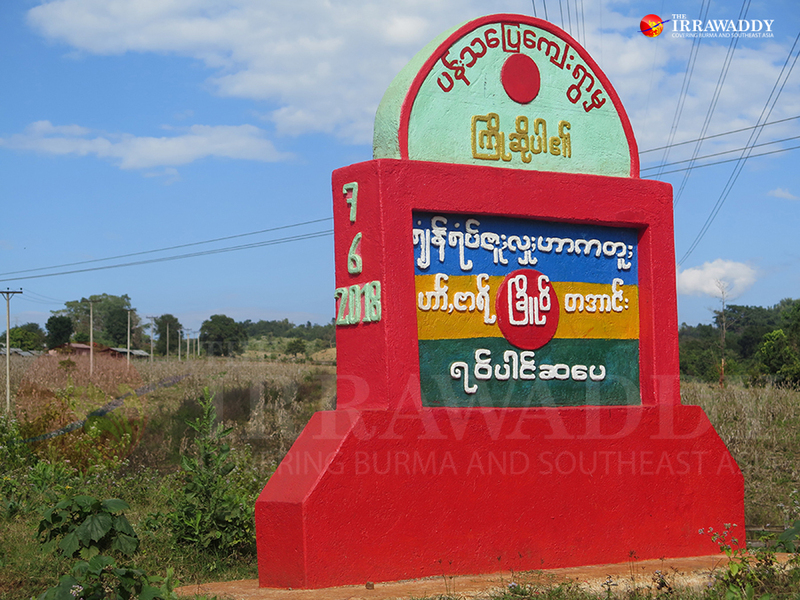 NAMTU—Residents of Shan State’s Namtu Township are having trouble coming up with a nearly 10-million-kyat payment demanded by the Restoration Council of Shan State/Shan State Army-South (RCSS/SSA-S). According to local residents, 361 households in several villages in the Pan Long village tract were asked to pay a tax of 25,000 kyats per household. The RCSS summoned village administrators on Jan. 19 and asked for the tax, said local residents, who sent a petition objecting to the demand to government departments, civil society organizations, local lawmakers, political parties and the RCSS. “It is hard for us to find 25,000 kyats. So, I have been working for others, earning 1,000 kyats per day to save up the money. We have submitted a petition because we are really having difficulties,” said a local resident of Panlong village who asked not to be named. While farming is the major livelihood for local villagers, frequent clashes in the area often force them to flee their homes, leaving them in financial hardship, he said, adding that locals also have to pay an annual tax to the Ta’ang National Liberation Army (TNLA) and Shan State Progress Party (SSPP), the political wing of the Shan State Army-North. In a letter to the RCSS, a signatory to the Nationwide Ceasefire Agreement (NCA), the local residents asked the group to reconsider the amount, saying they are suffering genuine hardship due to the clashes in the area. They also cited Chapter 3 of the NCA, which bars armed groups from demanding money, property, food or labor. “Some six days ago, the RCSS asked for 27 gallons of rice from each household. Though they said they wanted rice, they in fact asked for the equivalent amount of money, charging 30,000 kyats for nine gallons. Six of my neighbors paid them. They also asked the entire village to pay a tax of 540,000 kyats,” said a resident of Pan Thabye village on condition of anonymity. The villagers promised that they would pay the money on Feb. 15, he said. This is the first time they have been asked to pay this tax. RCSS spokespersons did not answer the phone when contacted by The Irrawaddy for comment. Daw Nan Seng Huang, a regional lawmaker from Namtu Township, said she had received the local residents’ petition. “I have to consult with my party [on how to respond]. But I will do as much as I can for them, as they are my constituents,” she told The Irrawaddy. Daw Nan Seng Huang belongs to the Shan Nationalities League for Democracy. There is a need to handle the issue delicately, as it concerns villagers’ security, she said. The Myanmar Army, the RCSS, the SSPP, the TNLA and the Kachin Independence Army are all active in the area. The RCSS entered Namtu Township in 2015. Until then, the area had largely been under the control of the SSPP and TNLA. Clashes broke out between the TNLA and RCSS in December 2015 over territorial disputes. In August last year, the SSPP joined the TNLA in attacking the RCSS. According to local residents, all three armed groups have a list of the number of households, populations and contact numbers of village administrators in the villages in their controlled areas, and conduct annual conscriptions of local residents. The Irrawaddy found that the SSPP collects taxes from over 50 villages in Namtu Township. Residents of some villages reported that the TNLA also asked for food as well as money, and forced them to act as porters to support troop movements. Villagers said the armed groups asked them to store weapons, ammunition and equipment in their villages. Village administrators were forced to provide information on the troop deployments and movements of their enemies. Locals suspected of having ties with opposing groups are beaten, they said. From 2016 through January, the TNLA allegedly abducted and tortured 60 Shan villagers in Namtu Township on suspicion of being RCSS spies. Some of them are thought to have been killed during interrogations, locals said. Meanwhile, Ta’ang villagers from Pan Kut village in Namtu Township accused the RCSS of abducting nine villagers who have been missing since last year. The Irrawaddy visited Pan Kut village in December, and found that residents were suffering from food shortages as military tensions between the RCSS and the TNLA, and the danger of landmines, were preventing them from terrace farming.